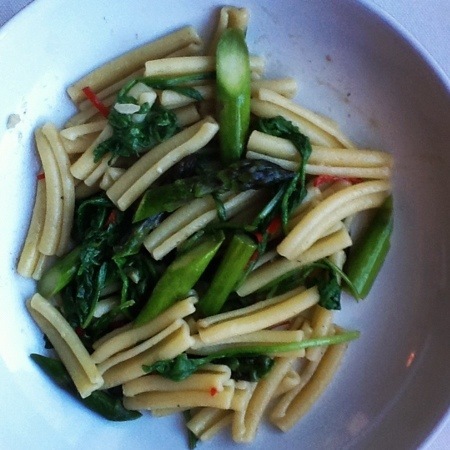 Casarecce with Asparagus, Arugula and Anchovy | One Picture, A Million Words. Dinner tonight is based on a formula that I frequently revisit when I am not particularly inspired to cook. Or when I want dinner to be eaten without any resistance from my children. Essentially, it is this: any grain or pasta + vegetables + protein. My little daughter, at a tender age, has unilaterally decided to practice selective veganism and I try my best to cook meals that will provide a complete chain of protein for her. The protein of my choice is usually a legume. I also love to add anchovies whenever I can because they pack flavour and nutrition into any dish (they are one of the few animal proteins that my daughter will accept). Toss in any other embellishments like garlic, chiles, lemon, fresh herbs and toasted nuts and I have a dinner that everyone will have seconds of. Easy peasy.